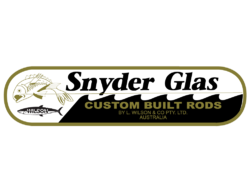 Snyder Glas rods are designed in Australia to exacting specifications to give anglers an unparallelled choice of quality fishing rods. Using original patterns and mandrils to ensure the best performance, Snyder Glas rods feature a full Fuji fit out on all models. Models include 10 series that feature threadline and sidecast models to give you choice like never before. The Contessa series was developed for the serious whiting and bream angler who wants the best performance for the best catches. A famous series of club spec glass rods aimed at all bream, blackfish and whiting scenarios. Built to be amongst the toughest surf rods in the land, the Fish Striker Series exceeds expectations. A series of rods designed primarily for rock fishing. A unique concept that gives anglers three tapers in the one rod. The great allrounder, the Jack Special series takes the best surf fishing has to offer and condenses it into two rods. The Snyder Glas Mag Bream Series features lightweight construction and unbeatable action. A range of true surf rods built to handle the heat when the fishing is hot in the surf. Based on the highly successful Gold Coaster, the North Coaster series brings a new look to old favourites. The Regal Series is a no-nonsense range of surf rods designed for heavy surf, big weights and large fish.